Another sad day during the Christmas Season. I think in every Catholic Household, throughout the rich liturgical year, you should choose to celebrate the feasts and commemorations that have meaning for your household. 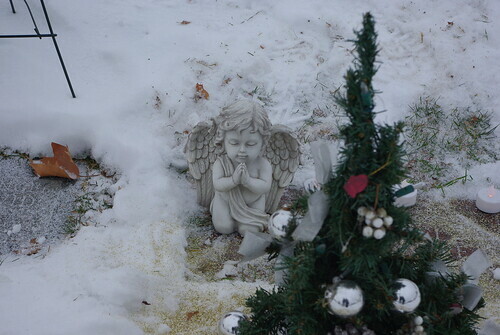 The Feast of the Holy Innocents is one of those for my household since I lost my own baby in 2002. It speaks to me as a mother in grief over the loss of my child in "lamentation and bitter weeping, refusing to be comforted for my child because he was no more." But more than that over the years, it reminds me to pray for the mothers and children who are victims of abortion, children lost to miscarriage and stillbirth, and other disasters. It is a day to remember the children, lives cut short, and to remember them and ask for their prayers too. 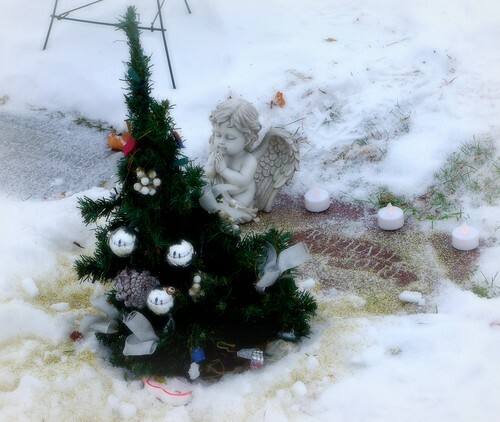 Today in a special way, I remember Dana at Roscommon Acres whose little boy died in a home accident just before Christmas. For me it will be a special day. It is true that the home in a mother's heart will always be there after the loss of a child. But I think it is also true that a new baby is the salve that makes the pain from that injury bearable. I didn't realize how much I still hurt until I compared my Christmases from 2002, 2003, and 2004 to the Christmases since Rosie was born. Certainly time and distance has helped, but the deep ache and emptiness I felt previously is not as severe. It's like remembering what it was like to be very hungry compared to being very hungry. It's that different. But going to mass today always helps me to heal some more. Tomorrow I will be attending a funeral mass for a little baby from our parish, and I hope I can bring some comfort there. If you have lost a child, a son or daughter, sibling, little friend, today would be a good day to remember him or her. Join your prayers with the ones at mass today and ask your little friend in heaven to be your intercessor with the Father. Today is also a special day to remember all of the little children who have died through abortion. A Prayer for the Victims of Abortion. Grave site of Baby John - found dead and alone at a construction site. 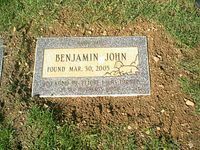 Given a grave and Christian burial in 2005. Leader (Mother and/or Father): Let us pray. O Lord Jesus Christ, because of a dream, you escaped being killed with the other babies of Bethlehem. As an adult, you embraced and blessed the little children who came to you. You wanted them to come to you and used them as examples in your teaching. Look now on the beauty and innocence of these children. Bless them, their parents and all who care for them. The leader signs the forehead of each child with the sign of the cross. In Your grace and goodness let these children advance in age and wisdom, aware of your love for them and desiring to love others in your name. Help them to be faithful to the gospel and to live lives of compassion. Then they will surely come to their heavenly home where they will live in perfect happiness forever. We ask this in confidence in your holy name. Leader to the children: "May God bless you and keep you. May your heart and mind be open. May you live a life of love and caring for all of God’s people and all of creation. In the name of the Father, and of the Son and of the Holy Spirit." The Leader then sprinkles the children with holy water. Today is also a good day to make a donation to theChurch of the Holy Innocents in New York. The Shrine is a great source of comfort to mothers who have lost babies to miscarriage, stillbirth, infant death and abortion. 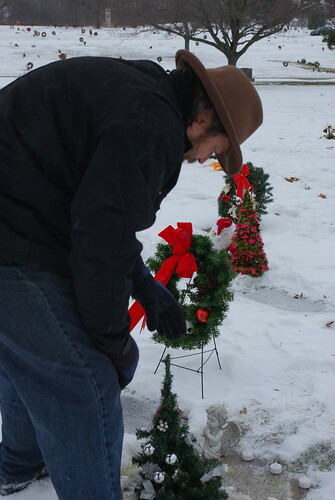 Mr. Pete, putting the finishing holiday touches on the grave of our son, Raphael last year - when we had snow! 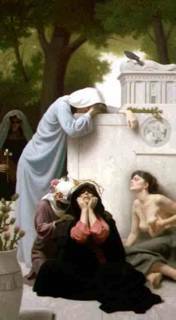 Other links for the Feast of the Holy Innocents in my Diigo links. What a sweet memorial for your Raphael. May you have comfort today. God Bless.